Renhold United are now just one point away from claiming their first ever Premier Division supported by Sportsform title after they ran out 1-0 winners at Eastcotts AFC thanks to a 25th minute goal from Alex Woolston. Their only rivals for the title, Flitwick Town, were held to a 3-3 draw at AFC Oakley M&DH, Ali Smith netting all of the home goals against Town replies from Liam Keene twice and Daniel Stafford once. Still in hope alongside both AFC Oakley M&DH and Flitwick Town of collecting this seasons silver medals are AFC Kempston Town & Bedford College who took their unbeaten away ways up to five games by winning 6-1 at bottom of the table Ickwell & Old Warden. 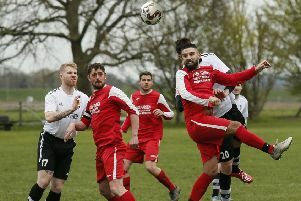 It was Ickwell’s seventh consecutive league defeat and took their losing home ways up to six games. Josh Sturniolo netted a hat-trick, Tyrone Kelly with a brace plus a penalty from Ryan Smith only being replied to once by Zak Rowe. For Wootton Blue Cross it was a move back into the top six after they netted a 5-1 home win over second from bottom of the table Caldecote and learnt of the news that Pavenham had won at Marston Shelton Rovers. Carl Ibbotson led the way with four goals alongside a single strike from Phil Matthews to bring up the nap hand against a lone Caldecote reply via Jake Wallace. Whilst the Rovers have now failed to win any of their last six home starts after being beaten 4-0 by Pavenham. Tom Ellis, David Netherway, James Owen and Nick Cakebread all found the back of the net and to cap a fine afternoon for the visitors goalkeeper David Whitfield saved a 90th minute penalty from Rovers Jamie Cerimanara. Elsewhere returning to winning ways on home soil for the first time in seven starts were Wilstead with their 4-2 victory over Sharnbrook, Paul Jones, Adam Budek, Matt Rosborough plus an own goal on their scoresheet against a brace in reply from Alex Strange. Division One supported by Wests Citroen Bedford. Cranfield United’s lead at the head of the Division One supported by Wests Citroen league table is now up to three points after they were gifted three points when Potton Town failed to raise a side to meet them at Crawley Road as second place Elstow Abbey were sitting the afternoon out. Following three straight home defeats it was a return to winning ways on home soil for third place Henlow who thanks to a lone goal from Matt Wilson just 15 minutes into the contest ran out 1-0 winners over AFC Oakley M&DH Reserves. Whilst fourth place Great Barford enjoyed a 6-2 home win over AFC Kempston Town & Bedford College Reserves, David Mulvhill netting four times and Ben Stock twice against Town replies from Jake Duxbury and Keggan Roberts. Elsewhere the other three games were all to end in victories for the visitors. At Miller Road, Sundon Park Rangers took their winning away ways up to four games in claiming a 6-3 win over Meltis Albion. Shaka Anderson claimed a first half hat-trick and was joined on the scoresheet by Nash Bennett twice and Matthew Conway against home replies from Alex Smith twice and Craig Damon once. Whilst also hitting six and taking their unbeaten away ways up to four games were Marabese Ceramics who won 6-0 at Bedford SA. Nicolo Miceli with a brace joined on the scoresheet by Antonio Miceli, Richard Follano, Michael Darnell and John Vooght. Making up the trio of away winners were Queens Park Crescents who ended Riseley Sports’ five game unbeaten run by winning 2-0 at Gold Street. Daniel Rasol and Toseef Masud netting the goals to do the damage. There is no change at the head of the dtable following wins for the top four clubs. For league leaders Stevington it was away win number seven on the bounce in winning 5-1 at Meltis Albion Reserves where James Bourke netted twice to go alongside a penalty from Gavin White and goals for Kieran Souter and Jordan Wright. Whilst second place Westoning remain unbeaten on the road this season and on a 13 game winning run after winning 5-3 at Renhold United Reserves, Glenn Cooksley netting three times and Shaun Cooksley twice to bring up the nap hand against United replies via Justin Ludman twice and Lewis Debbeneditis once. For third place Clapham Sports it was a 3-1 home win over Marston Shelton Rovers Reserves with Grant Williams, Sam Maddix and Paolo Grasso all finding the back of the net against a lone Rovers reply from Carl Borromeo. Whilst fourth place FC Houghton took their unbeaten home ways up to nine games in beating Wootton Village 4-0, Garvin Watson netting twice alongside single strikes from Lawrence Taylor and Shaun Fahy. Down at the other end of the table for bottom side Wilstead Reserves, despite goals from Matt Johnson and Luke Prietzel, it was a 7-2 defeat at Elstow Abbey Reserves. The Abbey all but won the game in the opening 14 minutes during which time Andy Klein hit a hat-trick to see them lead 3-0 at half-time before second period goals came via Myles Ferraro (60mins) Jason Fleeting (72/86 mins) and Klein netting a fourth on 75 minutes. Whilst second from bottom of the table Caldecote Reserves have now lost six home games on the bounce after being beaten 6-2 by Bedford United, Thomas Donnelly and Rory Cochrane both netting twice plus an own goal and a goal from Aaron Van Horne marking the United scoresheet against home replies via a Joe Rowley penalty and Tom Dupey. Elsewhere it was an end to Kempston Hammers three game unbeaten home run after they were defeated 3-1 by Kempston Athletic who themselves were ending a three game losing away run. Mark Nicholson, Tom Knight and Billy Mills were on the Athletic scoresheet against a lone Hammers reply from Matt Dingley. Cranfield United Reserves remain unbeaten on home soil this season and now on a nine game winning home run after they defeated Sandy Reserves to remain one point clear at the head of the division three league table. Daniel McLaren scored twice and Phil Kempsell once against a lone reply from Connor Stratford. Whilst second place Lea Sports PSG are now on a seven game winning away run after emerging 3-2 winners at third place Flitwick Town Reserves to end their hosts seasons unbeaten home record, Sean Dixon, Will Tyler and Ryan Darby netting the vital goals against Town replies via Ryan Hill and Benn Ward. Now up into fifth place in the league standings are Dinamo Flitwick who won 6-3 at second from bottom of the table Westoning U20. Dale Goldie leading the way with four goals and joined on the scoresheet by Matthew Jarman and Barrie Lee Hannam against a home hat-trick in reply from Nick Shirley. Whilst returning to winning ways for the first time in five starts were Shefford Town & Campton A who ran out 6-0 home winners over White Eagles.Scott Frusciante netting four times alongside single strikes from Dean Linsell and Ryan Lewis.